Educational Qualification: Candidate should be MBA with Specialization in Finance / CA and Should have a thorough knowledge of accounting standard. The person should be accounting finance and projecting having experience of 2 years probably in a transport company. 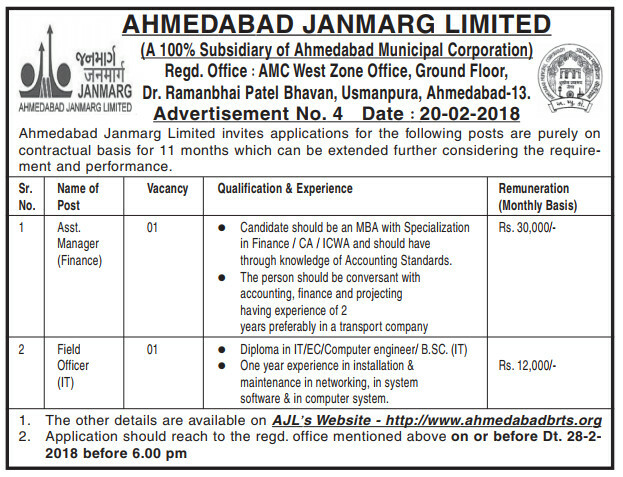 Educational Qualification: Diploma in IT / EC computer engineer / B.Sc (IT). one year experience in installation & maintenance in networking. in a software system & in a computer system. 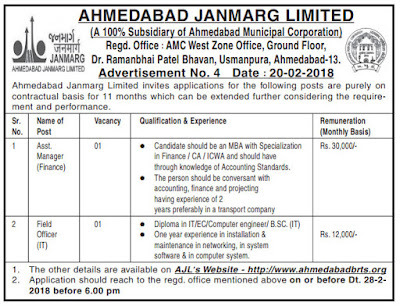 Address to sent Applications: AMC West Zone Office, Ground floor, Dr. Ramanbhai Patel Bhavan, Usmanpura, Ahmedabad-13.